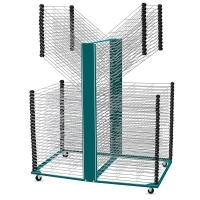 Perfect for commercial shops, schools, and other institutions, AWT’s newly re-engineered Saturn Tensor-18 Drying Racks offer both economy and mobility with more standard features than before. 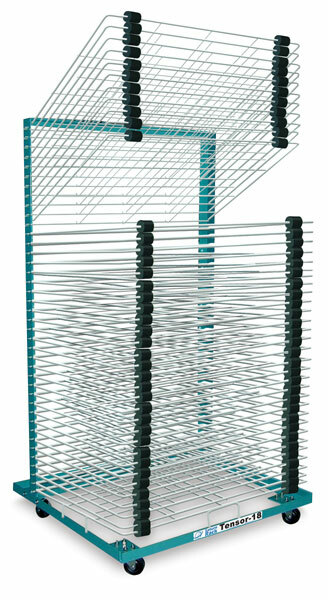 These versatile racks feature deep, 18" × 24" (46 cm × 61 cm) trays and solid steel construction with two rubber tray bumpers, allowing sufficient space for airflow between the shelves. These rubber bumpers not only hold more weight and larger sheets but also help maintain stability and proper shelf spacing. 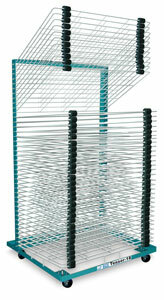 Saturn Tensor-18 Racks are also equipped with TrayLock, a positive locking mechanism that holds the racks firmly in place after they are lifted up to adjust or move substrates. Four casters swivel with ease, making these racks invaluable in organizing production under the most restrictive shop or classroom configurations. ® AWT is a registered trademark.® Saturn is a registered trademark. ™ Tensor-18 is a trademark.